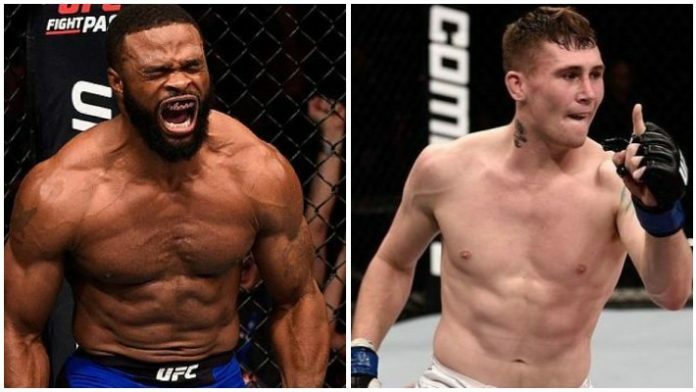 After over a year away on the sidelines, UFC welterweight champion Tyron Woodley returns to the Octagon this weekend when he fights top contender Darren Till in the main event of UFC 228. A lot has happened in the 13 months since Woodley’s last fight. The man he beat in his last title defense, Demia Maia, isn’t even relevant in the division anymore. Since Woodley’s last title defense, Colby Covington became the interim champion when he beat Rafael dos Anjos while Till emerged as a title contender with a controversial decision win over Stephen “Wonderboy” Thompson and Kamaru Usman showed he’s not far behind with his own beatdown of Maia. The division has changed a lot in just over a year, but finally things will be back to normal this weekend when Woodley finally fights again. For Woodley, he spent a lot of time on the sidelines chasing a superfight only to not have one materialize. And right when it looked like he’d fight Covington in a grudge match to unify the belts, the UFC stripped Covington of his interim belt and gave the title shot to Till instead, one because Dana White and co. needed a main event for UFC 228, and two because the UFC wants to push Till and hope he becomes a star. For Woodley, fighting Till isn’t the ideal situation. Even though Till is a big name right now, he’s still very unproven as a pay-per-view draw so it’s not like this is a money fight which is what Woodley wanted this whole time. It’s also a very dangerous fight for Woodley as Till is a powerful striker and has the confidence an undefeated fighter has, not to mention Till is the biggest welterweight in the division and 11 years younger than Woodley. So it’s a very tough matchup in that sense. But if Woodley wants to keep chasing the title of the greatest welterweight of all time and lure other big names for a superfight then this is a fight he has to win against Till, and it’s a fight he has to look good in. As for Till, the UFC has gifted him with a title shot when he didn’t really deserve it over guys like Covington and Usman. But he’s getting it anyways and it’s an amazing opportunity for the young Brit, who is teetering on the brink of stardom. Till has looked really good overall in the UFC, despite a disappointing performance against Thompson after a horrendous weight cut, but Woodley is no doubt the biggest test of his career to date. Not only does Till have to go in there and beat Woodley, who is one of the most well-rounded welterweights to ever fight in the sport, but he also has to make weight, and we all know what kind of a struggle he’s had making weight in the past. This is actually in many ways a must-win fight for Till, because if he loses the UFC might force him to move back to middleweight. That is, if he even makes weight in the first place. Both Woodley and Till are excellent fighters and this is going to be a solid main event. Both men want to be the best welterweight in the world and hold that title. Woodley has worked so hard to be at the place where he is in his career right now while Till has worked hard to get this opportunity. Even if he doesn’t deserve it over a few others, that doesn’t mean Till can’t win this fight. With so much on the line, I’m expecting both men to come out and put on an epic fight for the fans, and we’ll find out late Saturday night who the best welterweight in the world is. Who wins this weekend at UFC 228: Woodley or Till? Leave a comment below.